Insurrections of the Mind thinks insurrections ought to happen only in the mind. Now a new collection marks the magazine’s centennial. Called Insurrections of the Mind: 100 Years of Politics and Culture in America (Harper Perennial; Paper $17.99), and also bound in blue paper covers, its attitude toward the past is many things, but it is not jaunty. Much has changed in a century: the aim now is timelessness. There are many sentences in the book that surely deserve to live again. John Dos Passos in July 1932: “Hoover or Roosevelt, it’ll be the same cops.” Graham Greene in Saigon in 1954: “The bar tonight was loud with innocent American voices and that was the worst disquiet.” Henry Fairlie on George Will in 1986: “This columnist who so manfully shoulders the burden of upholding our culture is an Atlas bowed under a balloon.” Leon Wieseltier’s lament for a time “when we had battles of ideas and not festivals of ideas.” Pauline Kael: “Did anyone guess or foresee what narcissistic confidence this generation would develop in its banal ‘creativity’? Now we’re surrounded, inundated, by artists.” That was in 1966. Hendrik Hertzberg’s review of Ronald Reagan’s memoir, from 1991, left me in stitches. But in many ways—all of them regrettable—this anthology is the product of its moment. 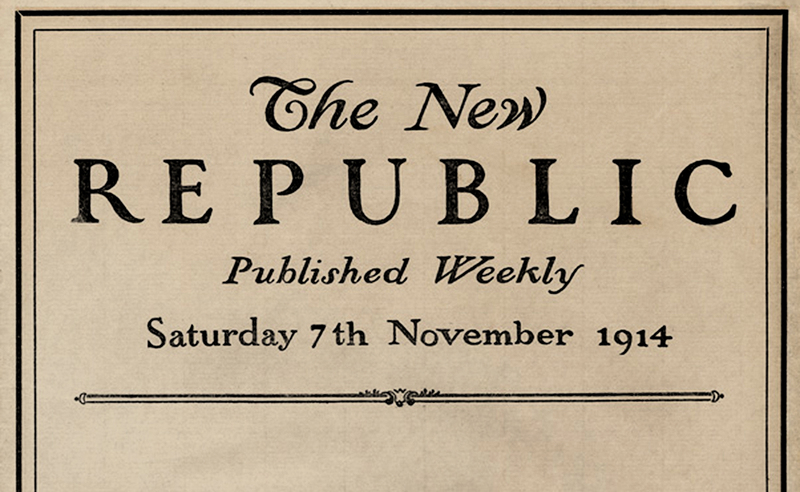 It includes not one of the editorials that were a weekly staple of The New Republic from its founding. Facebooker Chris Hughes purchased the magazine in 2012 and abolished them. Our only guide is the volume’s editor, Franklin Foer, now in his second stint at the magazine’s helm. In a table-setting introduction and comments before every dish, Foer offers a flat-footed and bizarrely apologetic history of The New Republic and American liberalism. Nodding to the boss, Foer describes the venture as “an intellectual start-up” and Croly’s agenda-setting The Promise of American Life as “in turns wonky and literary.” Senior editor John Judis is “immune to some of the faddish thinking that occasionally inflicts the rest of us.” (“Inflicts”—one of several times I feared I was holding an uncorrected galley.) Not once or twice but on six occasions does Foer describe The New Republic’s brand of liberalism as “hardened” or “hardheaded.” That, alas, is not counting his declaration that liberalism’s “expectations for politics and human nature remain on the hard ground, not up in the utopian sky.” This in a volume containing George Orwell’s “Politics and the English Language” (promoted online as “George Orwell’s Brilliant Guide to Writing Well,” without apparent irony); this from a writer with the nerve to decry the “rank hypocrisy of Orwell’s use of the passive voice.” Hmm, what to prescribe? Ah! The politics of cliché: “People who write in this manner usually have a general emotional meaning—they dislike one thing and want to express solidarity with another—but they are not interested in the detail of what they are saying.” Thank you, Mr. Orwell. Given that Bill Clinton will be headlining The New Republic’s gala this month—and that Credit Suisse is the magazine’s “centennial sponsor”—it is not surprising that the 1990s are alloted 124 pages to the 1930s’ meager nineteen. But one wonders at Foer’s eagerness to pronounce as “befouled” the politics of Edmund Wilson circa 1931—“the hour,” as Wilson writes, “when the planless society, the dehumanized urban community [was] bankrupt.” Perhaps Foer files Malcolm Cowley, along with Henry Wallace, among “our more disgraceful contributions to American life,” intentionally excised. That would be graceless. But typical. “The New Republic raked FDR on a regular basis,” Foer complains, “even when it should have been nodding its head in agreement with his policies.” Foer glosses the magazine’s neocon 1980s and 1990s as “a period when it gleefully attempted to overthrow the oppressive orthodoxies of liberalism.” Race isn’t considered until the March on Washington. Without explanation, the volume skips from 1966 to 1974. After submitting an essay on “The Corruption of Liberalism” in 1941, contributing editor Lewis Mumford asked the editors to remove his name from the masthead. “Like the sun-dial,” he wrote, liberalism “cannot tell time on a stormy day.” This anthology reveals an abiding commitment to the willfully quixotic notion that insurrections ought to happen only in the mind. All that said, it’s a pleasing read. “The past is the substance out of which the present has been formed,” Irving Howe wrote a 1991 essay, reprinted here, “and to let it slip away from us is to acquiesce in the thinness that characterizes so much of our culture.” A toast to The New Republic, then, for this lumpy but desperately needed thickener.